First Day of School Frames are AWESOME! These are everywhere & we do not know who to give credit to but THANK YOU! We hope ours inspires someone to make one, too. They are so easy!!! We got to share this one last year because we were on the same grade level. Talk to your team/partner maybe you can share the cost and the product! We started with a frame from Hobby Lobby & those cute little wooden pieces that you do not have to paint. The letters are from a foam package set. Lay it out, hot glue it all together and presto! No mess & no headaches! 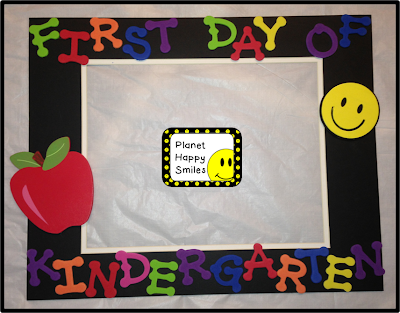 A great frame for fun 1st day of school pictures! Unfortunately, we have both changed grades since we made this .... so now we are in the same boat of making new ones. Time to go shopping!!! We will post our new ones when we get them made! Liebster Award~ What an honor!